Fighting climate change . . . with microbes | Chatham-Kent Agriculture Development | We Grow For the World! A Chatham farmer is calling on his colleagues to take steps to remove greenhouse gases from the atmosphere by supporting organisms not visible to the naked eye. Bob Kerr, who has farmed full-time since 1971, said microbes and their relationship with plants need to be supported to fight climate change. 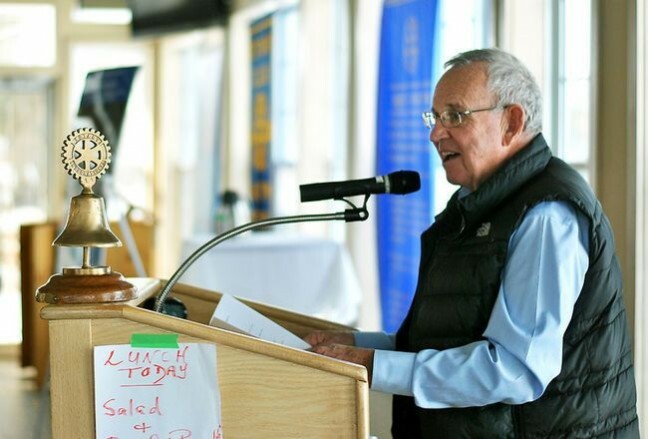 As much as 40 per cent of the sugar created through photosynthesis is used to feed these microbes in the soil, which in turn brings minerals and other resources back to the plant, he explained during a talk to the Rotary Club of Chatham on Wednesday. “The microbes add organic matter to the soil that’s made by plants and plants make it by extracting greenhouse gases like carbon dioxide, turning it into carbon and soil organic matter, which is sequestered long-term in the soil, taking it out of the atmosphere,” he said. This process is necessary to support, said Kerr, because the latest research has found reducing emissions alone will not be enough to keep the rise of the global temperature to less than 2 degrees Celsius, which is the threshold set in the Paris climate agreement. Kerr said there are a few changes farmers could make to support microbes. They include reducing tillage, protecting the soil surface with mulch and growing cover crops between the income crops, having three or more crops in rotation with multiple species in the cover crops and being considerate of the side effects of pesticides. These steps could lead to more photosynthesis, which means plants will take more carbon dioxide out of the atmosphere, he said. The Harvard-educated farmer said he has taken some of these steps on his own farm, including growing cover crops and looking after the microbes in the soil, but he realizes he is behind on reducing tillage. Supporting microbes is about more than fighting climate change, said Kerr. He said top soil is being lost at a rate of one millimetre per year, or one inch every 25 years, while nature replaces top soil at a rate of one inch every 1,000 years. With the world’s population expected by the United Nations to reach 9.8 billion in 2050, the loss of top soil potentially means losing the ability produce enough food, he said. “We have to increase soil organic matter and the way to do that is by looking after the microbial life in the soil,” said Kerr. The steps noted above also lead to healthier plants with more vitamins and antioxidants, as well as an increase in food mineral density, which means people can eat less and feel satisfied, he said. Kerr noted these ideas are not his own, but collected from different articles he has read and experts he has heard speak at conferences. He also acknowledged farmers will need an incentive to change their practices and government-created carbon credit programs could be the answer. “It can give people an incentive to reduce emissions and then if you take the proceeds from that, you could reward farmers for extracting carbon from the atmosphere,” he said. The process for how the money collected through these programs will be spent has not been decided, according to Kerr, so he is “making a passionate case” for farmers to be paid based on increases in the concentration of carbon in their soil.